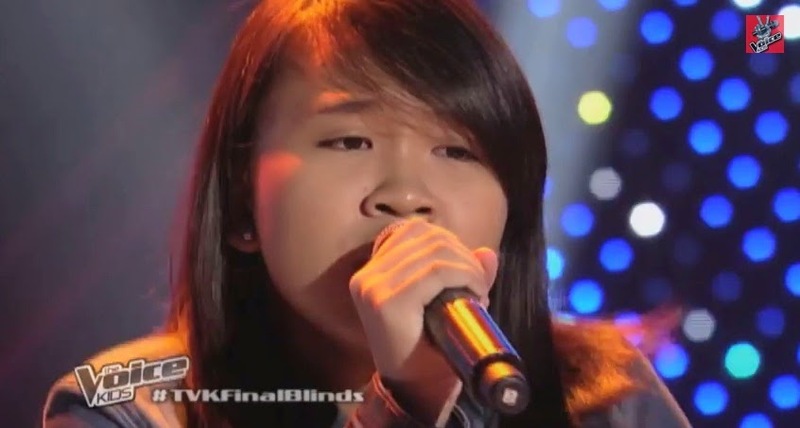 Manila, Philippines - Angel Aguilar performed Beyonce Knowles' hit song "Halo" during the final blind auditions of ABS-CBN's top-rating and Twitter-trending singing reality show aired on Saturday June 21, 2014. The 14-year old kid from Bacoor City, Cavite impressed the judges Sarah Geronimo, Bamboo Manalac and Lea Salonga. Angel chose Coach Lea. Angel Aguilar is the 12th 3-chair turner on The Voice Kids Philippines. Other artists who are included in the elite list of 3-chair turners are Jimboy Garcia, Darlene Vibares, Nathan Bautista and Echo Claridad , Arianna Ocampo, Isaac Zamjudio, Mitz Tanguilan, Giedie Laroco, Eufritz Santos, Kyle Bernido and Khen Lobaton. The Saturday's episode of 'The Voice Kids' dominates online conversations with '#TVKFinalBlinds', 'Next in Line', 'Coach Lea', 'Kulasisi', 'Rein', 'Angel Aguilera' and 'Luis Manzano' among the trending topics.